The last few years have seen all the major TV manufacturers turn their focus to design. Colour, materials, bezel design, user interface – TVs have moved a long way from the ugly looking plastic wood stuck onto and around an almost universal silver colour of the 70s and 80s. Sony has pushed design front and centre with its new Monolithic Design. It’s when an object stands out in a space, yet blends into that space. I know it’s a contradicting idea, but it refers to something that produces an attractive aura, yet it never disturbs the space. It means that the user can concentrate on the extraordinarily beautiful screen when it is turned on. When the television is switched off, its gorgeous single surface becomes something to decorate the living room. 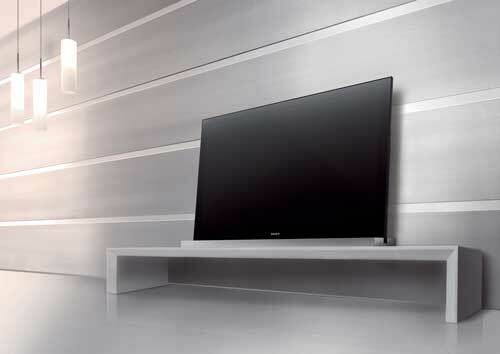 Sony have been successful in terms of beauty, the TV is indeed an attractive object. The Sony Design team strove for a selection of materials that would contrast, serving to not only draw the eye, but to make the TV seem more akin to furniture, rather than simply an electronic device. Primarily then it is the interplay between the brushed aluminium, and the high gloss glass. And yes, you read that right, glass is used. As a rule LCD TVs use a polycarbonate material for the screen, its use seen as one of the strengths in the plasma versus LCD debate, in that the polycarbonate screen would not reflect as much light as does the glass screen used in plasma TVs. The designers get around this by use of a tint in the glass to lessen its reflectivity. Have they been successful? Yes. I saw this television work in one of the harshest of all TV watching environments – the retail store – and I can attest that the picture looked good, and there was no problem caused by the many and varied banks of lights, or banks of other televisions. No reflection, and the Motion 200Hz, or Motion 100Hz (depending on which of the two models you look at) produces a fine high definition image, and works well in showing you a smooth picture when showing fast moving images. Glass attracts finger marks, so to combat this the touch-sensitive buttons are located behind the TV, easily accessible to adjust volume, colour etc, while on the bezel you can see the menu items illuminate when you touch the various buttons. The Monolithic Design TVs out of the box ship with a very conventional type of stand. But as an option, Sony offers up another distinctive feature, a stand that rather than standing the TV on a pedestal, the TV instead drops into it the stand, held in a deep groove. Once in, you have two ways you can stand the TV – upright, or you can recline the TV by six degrees. Sony’s thinking here is that so much of the modern audiovisual furniture we place television on is quite low, as can be some of the lounges viewers sit on. The six-degree tilt is designed to deliver a more ergonomic viewing angle. This is right in line with recommendations of how we should place the screen or monitor when we use computers. Monitors need to be placed in such a position that we don’t strain our necks as we work. You don’t have to use the tilt, but it’s there as an option, allowing you to tune the position for your viewing comfort. Choosing the optional stand offers one more advantage. They are perforated with very small holes, working to improve the sound of the television’s speakers. The video below introduces the key members of the Sony Monolithic Design team, outlining what they set out to achieve, and what inspired their thinking. What’s next for Monolithic Design? Sony is also making four Blu-ray players in the Monolithic Design range, and three home theatre surround sound systems. We’ll have articles on these devices very soon. As I said above, these really are lovely looking TVs, on and off. I do think making the stands optional is an error. If these TVs are all about design, then the design concept should be maintained in full. The optional stands look better, sound better, and are I think integral to the concept of Tatazumai. I don’t know whether it was simply a marketing decision to keep the sale price under certain price points, but it definitely does lessen the aesthetic. If you do look at these TVs be sure that you know that the TV you audition in the retail store could well be using this optional – and superior – feature. 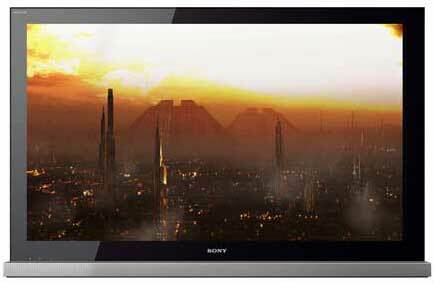 That quibble aside, what Sony has made is a TV that I think matches the aesthetics of an AV marque like Bang & Olufsen, without the big(ger) hit to your bank account.